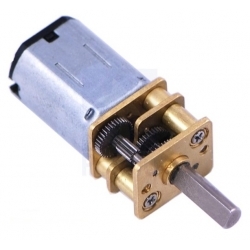 This gearmotor is a miniature (0.94" x 0.39" x 0.47"), high-quality, high-power motor with 10:1 metal gearbox, similar to Sanyo’s popular 12mm gearmotors. 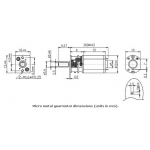 These units have a 0.365"-long, 3mm-diameter D-shaped output shaft. These tiny, high-quality motors are intended for use at 6V. In general, these kinds of motors can run at voltages above and below this nominal voltage, so they should comfortably operate in the 3 - 9 V range (rotation can start at voltages as low as 0.5 V). Lower voltages might not be practical, and higher voltages could start negatively affecting the life of the motor. All of the micro metal gearmotors have the same physical dimensions, but they come in a wide range of gear ratios—from 5:1 up to 1000:1—and let you choose between two different motors: high-power (HP) and standard. 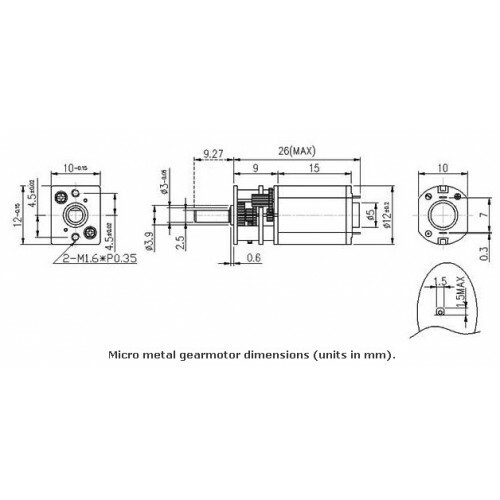 The gearbox has a long (0.365" or 9.27 mm), 3mm-diameter D-shaped metal output shaft, and the brass faceplate has two mounting holes threaded for M1.6 screws (1.6mm diameter, 0.35mm thread pitch). It weighs approximately 0.35oz (10g).